With all of the reboots, remakes, and re-imaginings which are flying around these days, we've seen plenty of movies which are based on stories which have been told before. Filmmakers are always taking a chance on re-presenting a familiar story, as the audience may have no interest in hearing it again. But, what about a tale which is over 2000 years old and has been told time and time again for centuries? And has been featured in several movies in the past? Can this film bring anything new to the table to pique the curiosity of filmgoers? Let's find out as we check out Exodus: Gods and Kings. 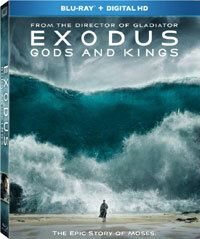 Exodus: Gods and Kings takes place in ancient Egypt. The land is ruled by Seti (John Turturro) and slaves, many of which are Hebrew, are forced to build the many monuments and temples. Seti's son, Ramses (Joel Edgerton) serves at his father's side, along with his best friend, Moses (Christian Bale), who is a soldier that oversees Pharaoh's army. When a slave uprising is on the horizon, Moses volunteers to meet with the slaves, and Nun (Ben Kingsley) informs Moses that he is actually Hebrew and is destined to be a leader. Following the death of Seti, Ramses becomes ruler and then learns of Moses lineage. For this, Moses is sent into exile. Once Moses finds a new place to live and starts a family, he is visited by God, who orders him to return to Egypt to save his people. Thus, Moses begins a quest to stop Ramses reign and free the slaves. Hollywood has turned out Biblical films since the beginning, and one rule has always been in place -- Make them big. Exodus: Gods and Kings certainly adheres to that rule. The movie features wall-to-wall visual effects and it has a grand, sweeping scale. We are treated to landscape shots in the deserts and the mountains, as well as huge battle sequences. More than once, the camera pans across Memphis (Egypt, not Tennessee) to show the size of the city and the many monuments which adorn it. Clearly a lot of work went into showing the opulence of the Egyptian empire, while also displaying big set-pieces like the parting of the Red Sea. The movie veers from the norm with it's portrayal of the more supernatural (if you will) elements of the story. The familiar elements are here -- Moses talking to the burning bush, the plagues ravaging Egypt -- but the film puts a different slant on them. The plagues are all given natural explanations, and appear to be hiccups on the ecosystem rather than God exerting his wrath. The consequences are still the same -- people and animals suffer and die -- but the rationale behind these events could be explained away in a scientific manner. The same holds true for the parting of the Red Sea. You won't find the classic walls of water here that we've seen in other versions of this story. In the case of the burning bush, and all of Moses' conservations with God, the film suggests that Moses was hallucinating. Something tells me that the fundamentalists weren't crazy about this approach to the story. Exodus: Gods and Kings may have expansive visual effects and a novel take on the familiar tale, but it's also missing some things as well. For a movie which runs two-and-a-half hours, the story seems rushed. The film opens with Moses and Ramses as adults who have a brotherly bond, but we don't get much info on how this connection formed or why Moses is a military leader. There's a brief dialogue scene at the opening, and then suddenly we're into a giant battle. I guess that grabbing the audience's attention with an action sequence was more important to working on the story. As one would suspect, this leads to a huge lack in character development. Who are these people? Why are they doing what they are doing? I got the feeling that the movie assumed that the audience would be familiar with the story and thus, it wouldn't need to provide any details, just pretty pictures. But, this creates a big disconnect between the movie and the viewer, and we are left to simply wait for the big scenes which we know are coming. Director Ridley Scott shows that he still has a keen eye for visuals, but over the years, it's become apparent that story and characters mean less and less to him. (Did you see Prometheus? Your witness!) So, Exodus: Gods and Kings offers the kind of big spectacle that one would expect from a Biblical epic, but it's a decidedly hollow film and I think that most will not find the moving religious film that they may have wanted. Exodus: Gods and Kings is oddly lacking in cats on Blu-ray Disc courtesy of 20th Century Fox Home Entertainment. The film has been letterboxed at 2.35:1 and the Disc contains an AVC 1080p HD transfer which runs at an average of 30 Mbps. The image is very sharp and clear, showing only trace amounts of grain at times and no defects from the source materials. The color palette here skews towards Earth tones, so when a brighter color appears, such as the red blood in the Nile, it looks very good. The image is never overly dark or bright, and the blacks look natural. The level of detail is excellent and some shots have amazing depth. The Disc carries a DTS-HD Master Audio 7.1 track which runs at 48 kHz and an average of 6.0 Mbps. The track provides clear dialogue and sound effects. As one would imagine, the "big" scenes sound great, as we are treated to detailed surround sound and wall-shaking subwoofer. But, just as importantly, the dialogue scenes sound fine and we can always hear those who are speaking. The Exodus: Gods and Kings Blu-ray Disc contains only a few extras. We begin with an AUDIO COMMENTARY from Director Ridley Scott and Writer Jeffrey Caine. "The Exodus Historical Guide" is an optional feature in which text will appear at the bottom of the screen which adds background information to the story. Unfortunately, it's not always scene specific, and thus feels useless at times. The Disc contains nine DELETED AND EXTENDED SCENES which run about 15 minutes. Nearly half of this is comprised of dialogue scenes from the first act of the film, but there is an interesting scene in which Moses and Ramses face of in the wild.